Whether the DTI is installed under the bolt head or on the nut end separated from the nut by a flat washer, bolt installers can turn the nut with whatever tool they have, usually air powered impact wrenches. 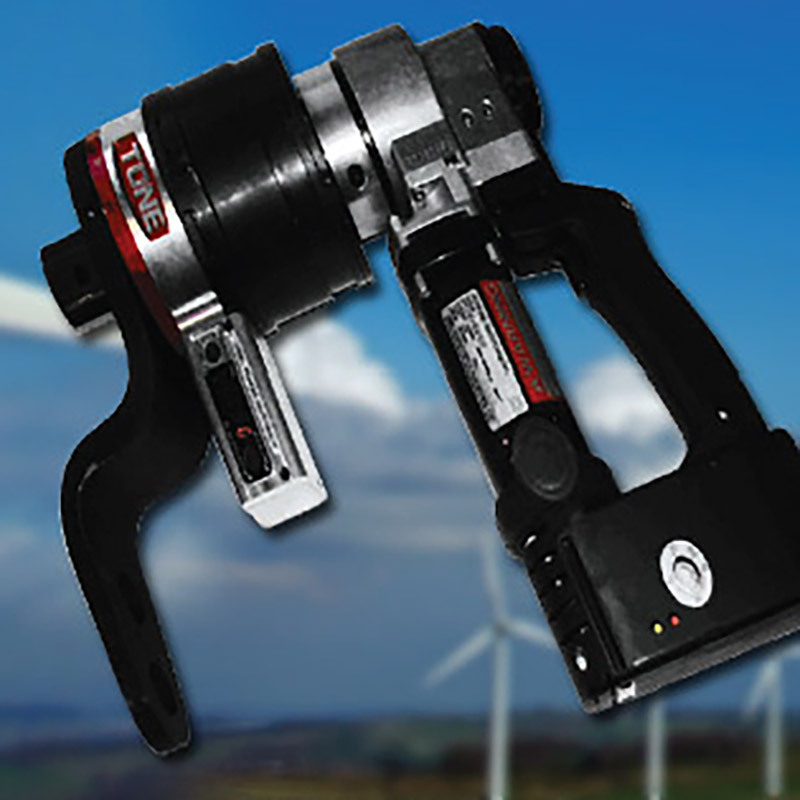 But now there is an alternative to impacting, the Maeda-built reaction-arm non-impacting 900 ft-lb electric wrench. We recommend them to erectors who don't want to use air tools, at least not for all their bolts. These erectors put the DTI on the nut end, and don't bother to hold the roll. This means it's a one-sided one man installation procedure with the advantage to the operator of knowing when the bolt has been sufficiently tensioned, as opposed to when it reaches a certain torque and breaks off, which is what twist-off bolts do. The state-of-the art in 120 volt non-impacting electric bolt tightening wrenches. 240 volt also available. Requires no compressed air: just plug in, engage the reaction arm, and go. Available in four models of 520, 900, 1550 and 2200 ft-lb torque capacity as shown (STC), and to 3690 ft-lb in the Tower Master model. Model STC12A (900 ft-lb capacity) tightens a 7/8" bolt in 5 seconds from snug without operator fatigue. Variable torque settings limit output when needed. If used with DTI's, bolts are tensioned with ease and accuracy. Quiet operation with equal power forward and reverse. "Soft start" clutch for operator safety. Please call EPH Tools for pricing 1-800-356-5624 or visit them on the web at www.ephtools.com. From our experience, the above torque ranges are applicable for the bolt sizes and grades shown. Wrench capacity is highly dependent on condition, air supply, hose length, etc., and may vary from that shown by a wide margin. On larger bolts, impact tools are often used for fast run-down and then HYDRAULIC tools are used for final tightening. TorcUp makes a very good line of hydraulic tools easily capable of 58000 ft-lb. torque. Note: All impact tools reach their rated working torque range in 5-6 seconds of hammering time. The longer the tool dwells the more damage to the hammer parts occurs.